Bonex DPVs are leading in technology and performance. Professional customers like police, coast and fireguard, military and special forces trust Bonex DPVs for their special demands. Bonex scooters are compact, powerful and feature many safety elements. Especially the high quality standard makes the Bonex the most reliable DPVs on the market. The handling on land and in the water is very easy and comfortable. The Bonex Scooters are build up as a system with a variety of accessories and helpful functions. This allows the Bonex DPVs to be used with the highest flexibility. For special missions Bonex created the Bonex Shuttle HP 1, which is a composition of two HP 1 DPVs and an engineered transportation unit. This conveyance shuttle is the first of its kind and enables carrying of heavy load and material. Furthermore it is able to tow up to 6 divers at the same time. 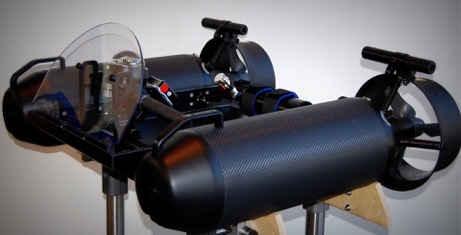 For a safe and easy usage under water it is equipped with a copyright protected Buoyancy Control System and, at the same time, it also is the lightest and fastest high performance shuttle. In addition, it impresses by its easy handling and maintenance. For safety reasons the system is constructed in a way, that it allows one- as well as two-hand-operation. 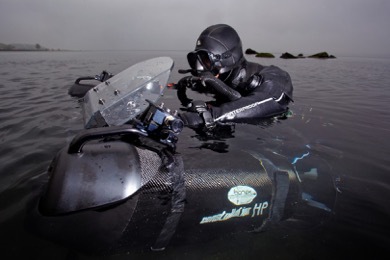 The Shuttle HP1 is endued with a mounting system for navigation- & other units, and a shield system for an easy handling under water. Furthermore, special quick connectors make a fast assembling possible. If needed the modular unit can be used as shuttle or two single DPVs. The extension of Navigation units, GPS, a Sonar and furthermore the LED Battery Level Indicator for an exact planning and performance of the dive operation is available. 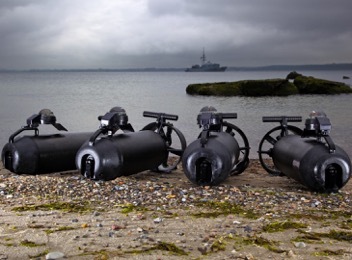 The shuttle can be programmed for tactical operations, supported by the scooter control system and the application of the BIS (Bonex Information System) on the DPV tubes.